Queensland launched a war against the fire ant invasion, but 12 years later, they’re still on the march. It was known, once upon a time, as Blunder Country. Richlands, about 18km south-west of the Brisbane CBD, is a semi-rural enclave with views north to a distant Mt Coot-tha and its spikey television towers. In the 19th century, an American bullock and braggart known as Bill the Blower hunkered down in a gully in this area with his two colleagues and, during a three-day bender, polished off a barrel of beet. According to historian Sue Kaeys, Bill boasted he’d neved committed an error with his bullock teams. Tired and hungover, his mates left him in the gully, assuming he would follow, and headed into Brisbane. When they went back to look for him, they found him driving his team back to town – without his wagon. So Blunder Country it became. In more recent times the region was home to vegetable gardens, honey makers and Italian farmers producing delicious table grapes. It is a classic fringe-of-the-city suburb. But the pond-ripples of the modern metropolis have started to wash through it. On Government Rd, for example, one side is standard suburbia with homes and drivesways. On the other, a nod to old Richlands – gated acreage properties with horse floats. Nearby paddocks now jostle with new taverns and sports bars, childcare centres, fast-food outlet and streaming peak-hour traffic from neighbouring Forest Lakes. Liz Cameron, a former resident of Government Rd, was checking the sweet potatoes, silver beets and Asian basil in her garden in February 2001 when she noticed a proliferation of ant nests. There were others near the chicken coop. When she and her children were bitten by these ants – the sting was acutely painful – the family took samples to the department of primary industries. The Camerons had unwittingly discovered the presence of the potentially deadly red imported fire ant – one of the world’s most invasive insects, believed to have hitched a ride to Australia from the southern US on a container ship. Their home was declared Infected Property One. More than 12 years later, after millions of baiting treatments, reams of data collected, chemical nest injections, aerial surveillance and $270 million spent, the ants are still with us and their footprint continues to expand. Has this resilient pest finally beaten us? Or has it been a case of bureaucratic bungling? Blunder Country, indeed. WE’VE BEEN HERE BEFORE. IN EARLY 2006, QWEEKEND VISITED THE FORMER Oxley Secondary College on Seventeen Mile Rock Rd in Brisbane’s west – headquarters to the government’s Fire Ant Control Centre – to report on the state of the eradication program. At that stage, the ant had officially been terrorising parts of Brisbane and South-East Queensland for five years following its discovery on Liz Cameron’s Richlands property, and at the Port of Brisbane, in 2001. News that the fire ant – Solenopsis invicta Buren – had been found in Queensland sent a shudder through the scientific community. The ant, originally from Argentina, had been wreaking havoc across the world – particularly the US, which faced a multi-billion-dollar annual bill for fire ant damage and control. It had the potential to kill livestock, render farmland unworkable and outdoor spaces unusable. In Brisbane, the DPI acted swiftly. Within days its officers went to both the Port of Brisbane and Liz Cameron’s home. The discovery of the ants had occurred five days after a state election that returned Premier Peter Beattie to power. His minister for primary industries was Henry Palaszczuk. “We decided to put in place an eradication program, so we took a submission to the [national] agriculture ministerial council,” remembers Palaszczuk, who daughter Annastacia is the current state opposition leader. An agreement was hammered out whereby the states and territories would contribute 50 per cent of the cost of the eradication program and the Commonwealth the rest. With that in place, the government then sought some serious fire ant expertise. “A couple of experts from the US came out and they sat down and helped devise an eradication program which, of course, meant the movement of soil, plants and everything else had to be monitored, and each yard in the Brisbane area had to be treated,” Palaszczuk says. One of those American experts was Professor Bart Drees, a coordinator of fire ant management in Texas. By June 2001, scientist Keith McCubbin had been appointed director of the new Fire Ant Control Centre – initially set up at Wacol, near Richlands, prior to moving to the former school grounds at Oxley. By September that year, the fire ant eradication program was in full swing. With more than $175 million pledged over several years from the federal government and the other states and territories, the fight was on. As early as May 2002 – just eight months into the program – the state government was trumpeting its success. In July 2003, primary industries minister Palaszczuk said he was set to slash fire ant centre staff at the end of the fire-year program because of the success in clearing out the pest. By July 2004, the government’s predictions were ahead of schedule. The Sunday Mail again reported: “For the first time in three years fire ant control searchers have been unable to find any ants or nests. The disappearance of the imported pests indicates a victory in the fight to eradicate them. Queensland’s stellar efforts at eradicating the ant were unprecedented. In under four years, we had expunged one of the planet’s most vicious, prolific, perplexing and cunning insects. But there was one person who didn’t celebrate the stream of good news. In October 2005, the shadow minister for primary industries and fisheries, Mike Horan, told state parliament of the Crime and Misconduct Commission investigation into the allegations of a “whistleblower” – a former DPI and Fire Ant Control Center employee – who questioned the integrity of the program. The allegations ranged from gross mismanagement and flawed data collection to a lack of monitoring of high-risk business activities and movement in and out of the program’s restricted zones, the latter punishable via state fire ant legislation. Horan met with the whistleblower and listened with alarm to her allegations. Following her submissions and the CMC investigation, she was drummed out of the public service and ended up working in the private sector. She was obviously trying to put out the view that they were going around saying they had it under control and everything was hunky-dory and that wasn’t the truth,” says Horan. The CMC’s three-year investigation found “no official misconduct on the part of any person.” It was taking no further action. The whistleblower was Brisbane-born fire ant program policy officer Dr Pam Swepson. Between 2001 and 2003, Swepson was working at Oxley, writing reports on the progress of the eradication program and becoming frustrated at the fire ant success story being fed to the people of Queensland. What she was putting into her reports was not tallying with the story of the scientific victory being fed to government, stakeholders and the public. In 2002, Swepson became a grandmother for the first time with the arrival of baby Caitlin, and she decided her granddaughter would not grow up in an environment dominated by the red imported fire ant. As she began her mission to tell the truth, Swepson could not have imagined that with Caitlin now aged 11, and with the fire ant eradication program still trying to measure the actual depth and breadth of the infestation, let alone posturing over the ant’s imminent demise, she would still be fighting to be heard. SWEPSON, NOW 65, JOINED THE QUEENSLAND DPI IN AUGUST 1987 as a training and development officer. She was an expert in “action research” – a data-based and participatory way individuals or organisations can approach problem-solving. She was seconded to the fire ant unit on the discovery of ants in Brisbane in February 2001. Her role as manager of community engagement was to liaise with city residents, businesses and industries likely to be impacted by the DPI’s fire ant eradication work. She would later become policy adviser within the National Fire Ant Eradication Program. Those documents, based on reports written by program managers and presented to weekly Fire Ant Control Centre meeting, were drafted from State Cabinet and state and federal program monitoring and primary industry bodies. In a short time, however, Swepson became concerned over discrepancies between what the program managers were reporting from the field and what was being offered to the stakeholders. She believed the “narrative” of the fire ant eradication was being spun to give the impression that the fight against the ant had been a success. This continued until March 2003, when Swepson decided to report the issue to the CMC. Swepson further claimed that: to date, surveillance staff had yet to determine the precise parameters of the infestation; there was no reporting on the percentage of high-risk areas complying with program requirements; the monitoring sites to determine the effectiveness of the baiting program was compromised by giving them additional and different treatments; and that significant numbers of properties within designated treatment areas were not treated. Swepson was not the only one to allegedly observe poor management and organization within the fire ant program. Her colleague at the centre, lawyer Roby Chapman, who drafted a lot of the early fire ant legislation, remembers Swepson being “horrified” at the erroneous reports about the program leaving the building. Chapman says Swepson’s protestations were repeatedly rebuffed. Nobody wanted to hear anything critical of this multi-million-dollar program. “I think it’s a case where they started lying at the beginning and they actually thought they would have some success, then as the years went on they were sort of trapped into the story,” says Chapman, who retired from the public service last year. “The government at no stage got good, objective advice from the public servants who mattered. It was a bit circular anyway. The government was also looking for a good success story. A difficulty the government of the day faced was the prohibitive cost of the program. There are two primary management phases when it comes to invasive pests or plant species. In the case of the fire ant, the first phase is an attempt at eradication. In this phase, the federal government and other states and territories agreed to contribute roughly 92 per cent of the costs. Queensland funds the other 8 percent. But if eradication is deemed scientifically impossible, the program move into phase two – control. That involves local authorities, and the general public, living with the pest but containing it to the point where it doesn’t leave Queensland’s south-east corner. At the point the “control” option is triggered, the enormous financial responsibility resides solely with the state. So the financial incentive to keep the fire ant program in a cost-share eradication mode is strong. On her retirement from the former department of employment, economic development and innovation’s legislation unit, Robyn Chapman, too, offered a disclosure to the then newly elected Newman Government. Almost a decade after Swepson’s initial observations, yet another senior figure linked to the fire ant program was making similar allegations about misreporting, mismanagement, a program rendered dysfunctional by poor decisions and profligate spending. The program claimed early success through its baiting regime. This involved lacking crushed corn saturated with soybean oil with bait, then replying on the worker ants to carry the bait into the nest to feed the queen, larvae and other workers. The objective was to kill or sterilise the queen. Over the years, however, other “search and destroy” methods were employed. One former senior team member – who declined to be named – said he not only assisted in baiting nests, but on dozens of occasions injected them with the insecticides chlorpyrifos and fipronil, both of which require approval permits for use from the Australian Pesticides and Veterinary Medicines Authority. “When they had a bad outbreak somewhere, they would go straight in and zap them with chlorpyrifos and fipronil,” the team member says. “They were injecting it straight into the ground. That’s there for 100 years. They just used [both insecticides] indiscriminately. From the point of injection you’re lookimg at two to three square metres, just dead. Instead of just being treated with chemicals to stop [the ants] breeding, they’d go in first with this very toxic chemical. The ants would be turning their toes up almost immediately. A similar permit for fipronil demands it be used by employees or persons “who have been provided with training in the proper handling and distribution of chemicals/baits for the control of red imported fire ants”. FOLLOWING THE QUEENSLAND ELECTION LAST YEAR, DR JOHN MCVEIGH became state Minister for Agriculture, Fisheries and Forestry, and inherited the most vexatious biosecurity matter in contemporary Australia – the fire ant problem. McVeigh met with Pam Swepson and was also acress the grievances of Robyn Chapman in his first months in office. Within weeks, too, he met with his counterparts across the country and convinced them the fire ant eradication program was worth continued funding. 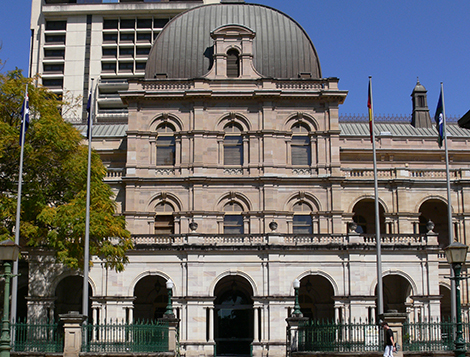 “There’s no doubt about it, at that first meeting I was put under a fair bit of scrutiny from [former federal minister for agriculture, fisheries and forestry] Joe Ludwig, and the other states who were I guess aware of all sorts of stories about mismanagement of the program in recent years under the former government here in Queensland,” McVeigh says. Despite the stakeholders agreeing to continue funding, McVeigh and his department began reviewing the program. In addition, independent reviews of management and financial operations of the program were completed. Managerial staff changes were made. “I think my study of the history over the last 10 years is that our efforts in Queensland towards eradication can compare very well, and [are] probably better than elsewhere in the world,” he says. In December last year, the program’s original ground zero – the Port of Brisbane – was declared free of fire ants. Similar declarations previously occurred at Doonan near Noose, and Yarwun near Gladstone. The difficulty for the Minister, however, is that after 12 years we still don’t know they full extend of the fire ant infestation in South-East Queensland. Biosecurity Queensland head Dr Jim Thompson says a new five-year program has been agreed to by the national partners. The first two years will limit the extent of the infestation, they the program will return to a full eradication phase. But does the program still have no data that defines the full and exact parameters of the fire ant problem? Fire ant program deputy director Craig Jennings says improved technology has armed the current surveillance methods – remote sensing and nest detection via two specially equipped helicopets – with what they need in terms of delineating the reach of the infestation. As for Keith McCubbin and his declaration back in 2006 that his eradication of the ant would be his retirement gift to Queensland, he reflects with hindsight. “I’ve short-changed the bastards,” he says, laughing at himself. Can the fire ants ever be eradicated? “The unknown that prevents me from answering that is the success of the [current] aerial surveillance program,” McCubbin says. BACK IN BLUNDER COUNTRY, LIFE IS LEISURELY DESPITE NEW DEMOGRAPHIC pressures and the changing face of the landscape. The suburb’s street names betray its past – Garden Rd, Oakview Way – and in new developments point to a cultured and beautiful future, as in the estate crescents and courts named after French Impressionist painters Renoir, Manet and Signac. But down on Government Rd – a dead end, courtesy of the Centennial Motorway – time has stood still. Infected Property One, the epicenter of fire ant doom, is much as it was in 2001. After more than 4380 days, the property remains “undeclared”- in other words, not free of infestation. The Camerons have moved on. The fire ants haven’t.